Restore life to thin, limp and lacklustre hair types with the Biolage R.A.W. 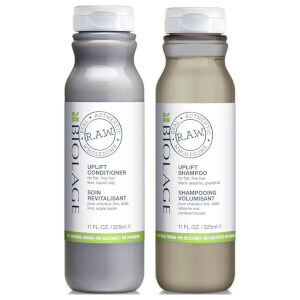 Uplift Shampoo and Conditioner; a daily duo that cleanses and conditions locks, whilst maintaining body and movement. Expect revitalised tresses with enhanced volume. Restore flat, limp and thin hair with the Biolage R.A.W. Uplift Conditioner. Especially developed for fine hair types, the creamy formula has been made from over 95% ingredients of natural origin, working to weightlessly condition and strengthen hair for enhanced body and lustre. Enriched with Kiwi extract and Kaolin Clay, it leaves hair feeling light and refreshed with optimum manageability and lustrous volume. Shampoo: Aqua/Water/Eau, Decyl Glucoside, Cocamidopropyl Betaine, Sodium Cocoyl Isethionate, Cocamide Mipa, Citrus Grandis Fruit Water/Grapefruit Fruit Water, Sodium Chloride, Glycerin, Parfum/Fragrance, Sodium Benzoate, Brassicamidopropyl Dimethylamine, Hydrogenated Coconut Acid, Salicylic Acid, Sodium Isethionate, Maltodextrin, Geraniol, Sesamum Indicum Seed Extract/Sesame Seed Extract, Sodium Hydroxide, Citric Acid. Conditioner: Aqua/Water/Eau, Cetearyl Alcohol, Brassicamidopropyl Dimethylamine, Actinidia Chinensis Fruit Water/Kiwi Fruit Water, Benzyl Alcohol, Parfum/Fragrance, Sclerotium Gum, Helianthus Annuus Seed Oil/Sunflower Seed Oil, Tartaric Acid, Caprylyl Glycol, Salicylic Acid, Glyceryl Stearate, Kaolin, Tocopherol, Glycine Soja Oil/Soybean Oil, Geraniol, Charcoal Powder, Polyglycerin-10, Polyglyceryl-10 Myristate, Polyglyceryl-10 Stearate, Citric Acid, Sodium Dehydroacetate.